2 bedroom apartment sleeping 4 people just 3 minutes walk to the centre of Hisaronu. HISAR GARDEN COMPLEX has one of the most sought-after locations in Hisaronu. This modern 2 bedroom apartment sleeps up to 4 people. All rooms have air conditioning, and there is a fully equipped kitchen which opens onto a main balcony over-looking the pool and gardens. The apartment has everything you need for a stress-free holiday, so you can completely unwind and enjoy what this stunning area has to offer. The complex has one of the biggest shared pools in the area (with a separate children's pool), which is set in beautifully landscaped gardens with stunning mountain views. The grounds have ample room for all guests to relax in without ever being crowded. There are also some big trees that can be used to find shade in the heat of the summer. Communal sun loungers are provided for all guests plus private sun bed cushions belonging exclusively to the apartment. There is also free unlimited wifi around the complex. Situated only 1 minutes’ walk from Hisaronu Town Centre, where you can find shops, restaurants and bars etc, it really is the perfect spot to spend your holiday! Excursions from the area are plentiful, there will be a welcome meeting provided by an English speaking tourist guide to inform you about the local area, car hire and any excursions you wish to book, for example the Dalyan River Trip which is a great day out and includes trip to Mud Baths, Jeep safari, Turkish Bath, Private Boat Trips etc. Included with your accommodation price is an arrival welcome basket of tea, coffee, sugar, milk, bread, cheese, jam, eggs, butter, fruit, water and fruit juice a weekly clean/change of bedding. 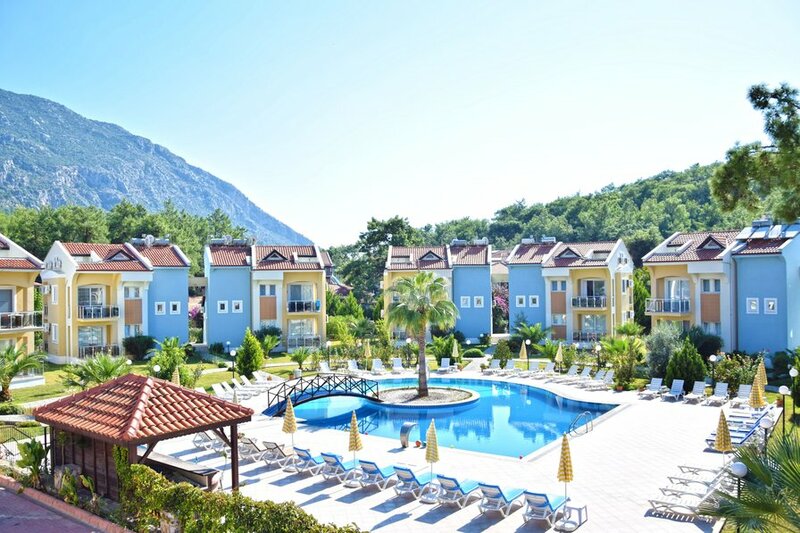 The touristic resorts of Ovacik and Hisarönü are located alongside the Fethiye - Ölüdeniz road, at the top of the mountain. With an altitude of approximately 300 meters, the area gives respite from the summer heat during the peak holiday season. There are endless activities to get stuck into...from paragliding and jeep safaris, to sunset cruises and turkish baths, as well as a great selection of restaurants, bars, shops and evening entertainment. Ölüdeniz beach and the famous Blue Lagoon are only 10 mins away by the regular local Dolmus bus, you can sit on the beach front at sunset and watch the para-gliders land in front of you, grab a bite to eat and a cocktail, and enjoy the beautiful sunsets. The large provincial town of Fethiye is built on the site of ancient Telmessos. Fethiye overlooks an attractive bay and is crowned by the ruins of an ancient fortress built by the Crusader knights of Rhodes and in the steep surrounding cliffs you can visit the ancient Lycian rock tombs carved into the hillside. Around the town you will come across sarcophagi rock dating back to 450BC. The Gulf of Fethiye is a broad bay dotted with small islands and furrowed by inlets and coves, enhanced by lush, wooded mountain slopes which sweep down to the shore. Fethiye has a large colourful harbour and marina where you can find the local fishing boats bobbing beside the sophisticated cruisers, yachts and catamarans which visit Fethiye. You will also see the traditional Turkish gulets, beautiful wooden vessels of varying sizes which leave from the harbour daily and visit the many coves and bays in the area. A wide promenade lined with cafes runs around the harbour and yachting marina, tables and chairs spilling out from underneath awnings and trees onto a water front terrace. Fethiye has an open market where much of the towns daytime action takes place. It is a riot of colours, sounds and smells, where you can buy a wide range of goods such as leather goods, Turkish carpets, gold and silver jewellery and much more. The town itself doesn't have a beach, but Çaliş beach is a long sand and pebble beach just 4km away. Or alternatively you can visit the famous and beautiful bay of Ölüdeniz which is just 15km away and has a beautiful sandy beach. If you enjoy natural beauty and nature you can visit the town of Kayakoy just 10km away up in the surrounding hills. This Greek settlement was abandoned during the population exchanges between the Greeks and Turks in the 1920's. There are about 1200 houses, which have remained unoccupied since then and the area retains a very melancholic atmosphere. The surrounding countryside remains unspoilt and is great for those who enjoying walking and exploring. Other places worth visiting include the natural phenomenon of Saklikent Gorge, which you can walk deep into during the summer months when the water levels are low. There are also many ancient sites all within 50km of Fethiye, Pinara, Simena, Tlos, Zanthos, Letoon and Patara to mention a few. During the spring these sites are a mass of wild flowers, herbs and the wildlife they attract, as well as being a fascinating insight into ancient Lycia and how the Lycians lived. There is also a small museum in Fethiye which also helps explain the ancient history of the area. There are many tour companies in Fethiye's centre, which offer tours to all the places of interest nearby. Or alternatively you could hire a car and explore around independently. These tour companies also provide diving courses, kayaking, jeep safaris and paragliding amongst other things. For those of you planning on touring around Turkey there are several large coach companies that have offices in Fethiye. They all use large modern air conditioned coaches which leave from Fethiye's bus station daily. Fethiye – Istanbul is 790 km. Fethiye – Ankara (Turkish capital) 630 km. Fethiye – Izmir 340 km. Fethiye – Antalya 280 Km. The nearest airport to Fethiye is Dalaman airport and is about 70 km away. We can also arrange car hire for day trips out, private airport transfers using luxury vehicles for an extra charge. In the event of any medical emergency there is 24 hour medical assistance in Hisaronu and a modern private hospital in Fethiye, with English speaking staff.